Inside every young woman is a princess…in search of her prince. In a culture that mocks the longing for tender romance and where fairy tales never seem to come true—do young women dare hope for more? For every young woman asking that question, this book is an invitation. Experience a romance that will transform every part of your existence and fulfill the deepest longings of your feminine heart. Geared for teen and college aged girls—parental guidance is recommended for younger girls due to some subject matters. For most of my young adult life, I had known Jesus Christ only as the One who had saved me from my sins. I had been looking to an earthly romance to fulfill the deepest desires of my heart. I had been searching for an earthly prince to rescue me, to carry me away to his castle, to love and cherish me forever—to fulfill my feminine desire for tender romance. Like so many modern young women, I gave myself to one shallow relationship after the next, only to end up lonely and heartbroken. I looked to human relationships to meet needs in my heart that only Jesus Christ was meant to fill. Until Jesus Christ becomes the Lover of our soul—the very center of our existence—we will always be looking in the wrong places to fulfill our feminine longing for tender romance. We will end up broken-hearted and disillusioned, time and time again. Christ alone can truly fulfill the desires of our heart. 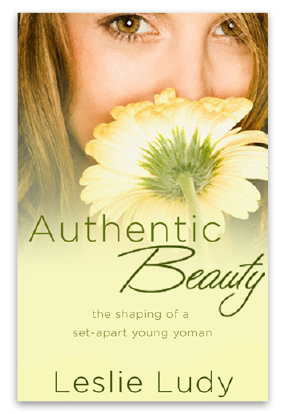 Authentic Beauty is a personal and practical book about becoming a set apart young woman in today’s perverse generation. It explores the boundless opportunities God has for the life of a young woman who makes Christ the first love of her heart and allows Him to shape every aspect of her existence.